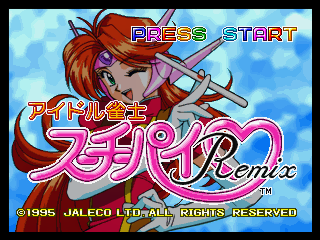 Idol Janshi Suchie-Pai Remix (アイドル雀士 スーチーパイRemix) is a table game developed and published by Jaleco for the Sega Saturn. It is part of Jaleco's Idol Janshi Suchie-Pai series. Game content is not changed from Idol Janshi Suchie-Pai Special, only part of the naked graphics and BGM has been changed. BG & Character CG (Yuki / Sachiko / Yukari): OSAMU K.
Main article: Idol Janshi Suchie-Pai Remix/Magazine articles.